The Isle of Jura is within spitting distance of the eastern shore of the island of Islay, off of Scotland’s southwesterly tip. The tiny island claims only a few hundred inhabitants, and exactly one whisky distillery. Perhaps this harkens back to a time in Scotland when every community of 200 people required its own distillery? Sounds like a place I’d like to live! The Isle of Jura distillery is owned by independent bottlers Whyte and MacKay, which also owns Dalmore distillery. The whisky of each is surprisingly similar, with lots of sherry-derived flavor, and some citrus elements. Jura is a little lighter in style and much more floral, while Dalmore is darker, sweeter, and more pungent. Neither is peated, except for some peat that might be in the water used to mash and proof down the bottles. 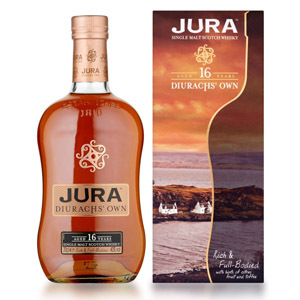 The 16 year-old official bottling, also subtitled ‘Diurach’s Own’ after the name for the people of Jura, spends 14 years in ex-bourbon, and then is transferred for 2 years into Amaroso Oloroso sherry casks to finish. Nose: Elegant citrus – grapefruit maybe, or bergamot. Mildly sherried, as befits the finish. If there’s any Island peat present, it’s in the form of a soft, ferny, heathery aroma in the distance. 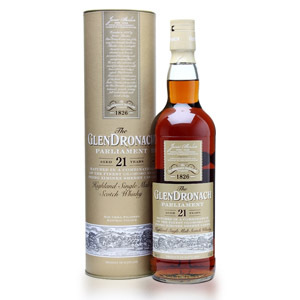 The fruit is fresh and bright, and backed up by a capable maltiness with breakfast cereal and spongecake. Soft, lovely, and floral. Very nice. Palate: Slightly chewy texture, and quite sweet. Candied orange peels, tawny fudge, blanched almonds, and marzipan. Not an ounce of burn on the tongue. Ladylike, even. Finish: The heather notes return, with honey and a bit of oaky tannins. A final wave of very mild citrus – just pith, maybe – and a ghost of bitterness. With Water: Several drops of water draw out a bit more of the eccentric aspects of the sherry, namely a leather note, and some lemon peel, which continues through the palate and finish as extra tartness. Water is not needed here, but does add something interesting. Overall: An eminently likable malt. 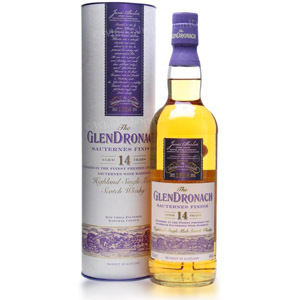 Flawless in execution, sweet and mild on the tongue, with a moderately perfumed aroma. This would be excellent with a mild cigar. Jura has a lot of ardent admirers, and I can see why. It is not intense nor challenging, but it is complex enough to reward contemplation. 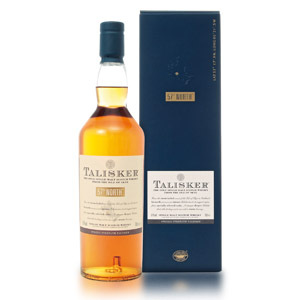 I have not been able to say this much recently, but this malt is definitely worth the $65 or so that it retails for. Owned, along with Dalmore distillery, by independent bottlers Whyte & Mackay, The Isle of Jura Distillery was built in 1962 and is the only distillery on the Isle of Jura, situated across a narrow strait from Islay. Process water comes from Loch a’Bhaile-Mhargaidh (the Market Loch). While the water flows through a great deal of peat, the whisky itself is not smoked and does not carry much peat character, in sharp contrast to most of its contemporaries across the strait. Jura malt, aged in bourbon and with some finished in sherry casks, is said to come into its own around the age of 16, the age of the distillery’s flagship official bottling. The distillery has only recently begun producing small amounts of peated malt for the single-cask market. They are both on my “to try” list – I have samples in my cabinet. So many whiskies to try, so little time! Hi Rodl, I just posted a review of the Superstition today: //scotchnoob.com/2016/04/25/jura-superstition/ – I also reviewed the 10 year awhile back.